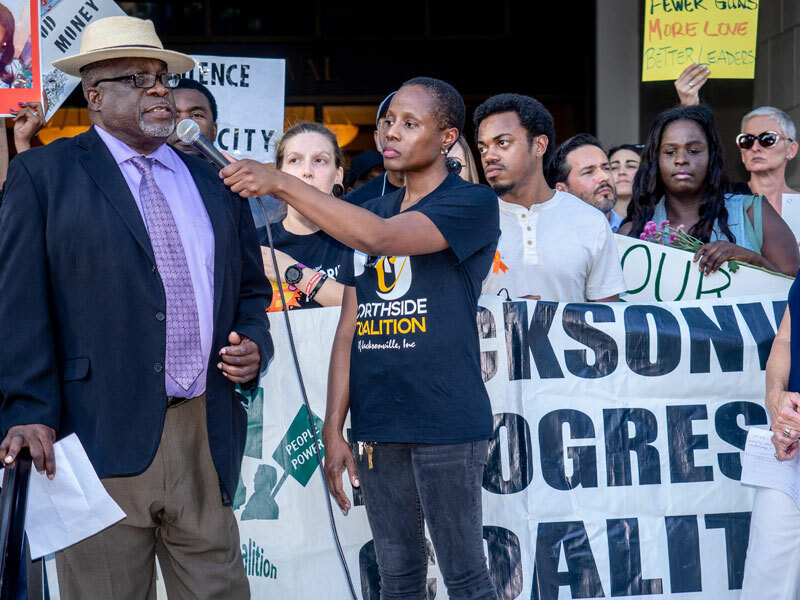 The Northside Coalition of Jacksonville focuses on the problems of social, racial, and economic injustice. For this plan to work, all the stakeholders, each of us, will have to work together like never have before. Individuals and communities can change for the better. The Northside Coalition believes we can restore hope in our city, our communities and our people. 1. Hold a town hall meeting to allow residents to question elected officials about any anti-violence and public safety plans being developed. (City officials have agreed.) The purpose of these two noticed meetings would be to open lines of communication, build trust, and tear down walls between residents and elected officials. 2. Close the gun-show loophole to cut off the availability of guns to people who should not have them. Private gun sales should be documented and all buyers should have to undergo background checks. 3. Create a multimillion-dollar plan of social and economic redevelopment which would include improved delivery of various public services, education, healthcare, and the arts. Major input and funding from the public and private sectors will be needed to fund these ideas. 4. Seek input from experts in the fields of education, health, music, and the arts. 5. Target disadvantaged areas such as zip codes 32206 and 32209 which have high poverty and double-digit unemployment rates. 6. Implement a massive job training and job creation element by working with various businesses, community colleges, nonprofits, and universities to understand true needs. 7. Develop and implement conflict resolution training by professionals in schools and on the streets. Collaboration with counselors in the public and private sector is critical. 8. Expand and support minority businesses. 9. Provide greater accountability and transparency in the criminal justice system and at JSO. Review policies, practices, and procedures to eliminate racial bias at JSO to enhance trust with the black community. 10. THE CURE VIOLENCE PROGRAM: The city is considering the Cure Violence program. We believe it will save lives and that the city should move to implement it with city leaders ensuring that enough money is committed from the outset to fully sustain at least the first five years of the program’s existence (about $4 million). Cure Violence is guided by clear understandings that violence is a public health issue. NCOJ believes community and strategic partnerships will be the key to the success of this initiative. We share information, take a stand and reach out to the public and politicians to help resolve community issues. We utilize public forums for debate, discussion and comment. We provoke community-led action for worthy causes. We bring together people of different ages, professions, skills, and backgrounds to provide volunteer support, different perspectives, ideas, and solutions. We are supported by the direct involvement of our neighbors.